'Oh I wish I had a river I could skate away on.' 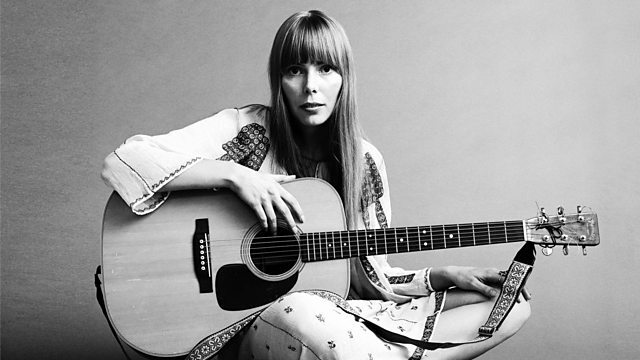 Personal stories of Joni Mitchell's song River, from her iconic 1971 album Blue. A new series of Soul Music begins with stories of Joni Mitchell's 'River', from her iconic 1971 album Blue. A song about the breakdown of a relationship and of a longing to be elsewhere that has become a melancholy Christmas anthem. Emotional true stories of what the song means to different people, including comedian Chris Forbes, who lost his father on Christmas Day; Isobel, who fell sick far from home and understands the longing to be elsewhere captured in the song; Laura, who heard the song while pregnant at Christmastime; writer Rob Crossan, who will forever associate the song with his first love; Canadian poet Lorna Crozier who describes the frozen rivers of her and Joni's Saskatchewan childhood; and from Joni Mitchell's biographer David Yaffe. Includes a rare live recording of 'River' from a BBC Concert in 1970, hosted by John Peel. The other versions of the song are by (in order of appearance) Joni Mitchell (Blue, 1971), Scott Matthews (Live Session for BBC 6 Music, 2011), Béla Fleck and the Flecktones (Jingle All the Way, 2008) and the Belgian indie choir Scala & Kolacny Brothers (Live Session for BBC 6 Music, 2011). Watch the animation - Professor Mary King describes how the song became a symbol of hope.